A lot of people aspire to be financially wealthy. Aside from working hard to save money for the future, people often get inspired by stories of luck and fortune, particularly those who won the lottery and other rags to riches personalities such as businessmen and some professional athletes. Indeed, dreaming that someday one would sleep in a room full of money is something that should be earned through hard work and perseverance. People often believe that becoming rich would be the solution to all financial problems. However, there have been stories in which people have gone the rags to riches route, only to go back to rags again. Lack of maintenance, as well as overspending of finances, are often the causes of such downward spiral. It is therefore definitely hard to hold on to wealth as much as earning it. Challenge the IRS. Being wealthy means paying high income tax rates, and the IRS may collect a share of one’s wealth after he or she dies. In order to avoid losing wealth, taking advantage of IRAs and 401(k)s should be considered. Also, the wealthy person may have to consult with an estate attorney capable of laying out a well-structured plan to help lower down the estate taxes owed. Any legal liabilities should be avoided. A wealthy person is more likely to lose large sums of money, especially if he or she loses a car accident or slip and fall lawsuit. It is best to avoid such legal liabilities. Beforehand, though, he or she must ensure that his or her insurance coverage is enough. Invest at your own risks. Being wealthy also means having access to investments that are considered too risky. Such investments might just be fraud, therefore incurring large amounts of financial losses. Indeed, trying to accumulate more wealth is a challenge. But then, taking advantage of safe investments right away is a good way to start, as well as leaving money that can be afforded to lose. Reorganize finances after getting wealthy. This step is vital in order to prevent any losses that one has gained. It is never a good thing to keep on borrowing money just to obtain even more wealth, which is why at the first instance of being at the “well-off” status; the person must be able to pay down any debt. Think of the future. Retiring at the right time won’t be a fruitful one if the wealthy person spends too much in an effort to preserve status symbols. Running out of money just in time for investment on nursing homes or long-term medical care is a very bad situation to be in. This is why investing for the future should be a priority at the onset of being wealthy. What is a life lived in luxury right now if you do not have plans for the future? It is really hard to maintain a wealthy status the same way as earning it. Taking these tips to mind, however, would enable any aspiring person to grab on to his or her wealth at the longest possible time. Author Bio: Steven Boccone is a New York-born economist, financial analyst and manager. He has worked for various financial institutions worldwide and currently manages a US-based global marketing company. He is an art lover, a traveler, and he maintains his own business blog. First, I have to work on GETTING a wealthy status (haha). But I agree that anything illegal should be avoided. There is no quicker way to lose your wealth than to have to pay legal fees! A lot of it comes down to spending. The key to maintaining any level of wealth is not spending to much of it. First of all, you will be supporting your assets. Also, by showing off that you have money, you become a target of those you would try to take it from you. I think that’s a good point about crazy investments that might come your way if you are wealthy. I’m sure many celebrities and professional athletes have been victim of not understanding investments and letting someone not looking after their best interests lose it all. people as very frugal and thrifty persons. They always spend their money wisely. I like to think that if I ever became super rich I would go the Bill Gates route and give away what ever I didn’t need. From experience with friends and acquaintances, the biggest problem the newly rich have in hanging onto their wealth is following bad financial advice – particularly with regard to crazy investment schemes and wild business opportunities. I agree with Ed that in essence it comes down to spending. Just look at all the professional athletes who become instantly wealthy with their first contract and then go on lavish spending sprees during their careers. Many of them end up broke after their playing days are over because they could not develop wise spending and savings habits. Excellent points. I would also like to suggest investing in appropriate insurance products to protect your assets, business, health, wealth, and interests from the multitude of risks both wealthy and non-wealthy people face. Lots of disasters out there can wipe out wealth very quickly. You never hear about the person who wanted to make it but never did. The person who tried hard, really hard, until their feet hurt, until they couldn’t try anymore and still couldn’t make it. I’m sure there are a lot of stories like this which are far more common that we just don’t want to hear. Some people are lucky, some aren’t and that’s it. It’s downright insulting to read these stories about “hardworking” people who made it and everyone else would also have been able to if they had just tried a little bit harder. Well, you make quite a valid point. I guess why we hear more of this kind of stories is because they are inspiring. Yes there are people who have worked hard and not made it, sometimes luck and other factors do play a role in success. But the hardworking-kind of stories give hope and inspiration that if perharps works hard enough, he might stand a chance to also achieve success. 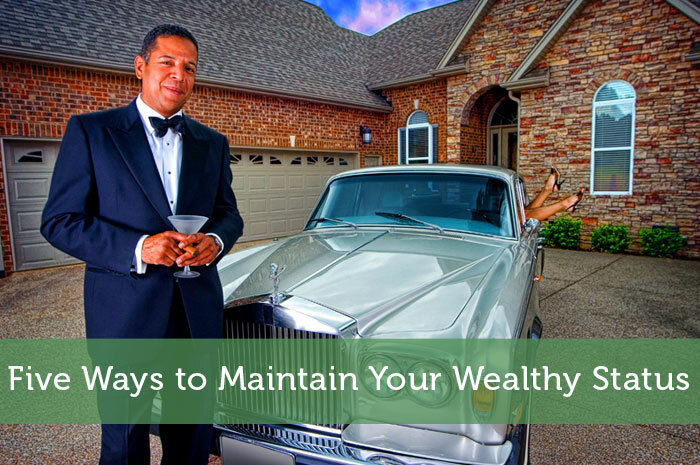 How I wish I would have a wealthy status and then apply these tips to maintain it. There is no easy way to get wealthy but to work hard and wise. I’m not yet rich but I will surely take note of those whenever I become one. 🙂 Thanks!